Following the release of The Tale of The Princess Kaguya, Studio Ghibli announced that they would go on a brief hiatus following the retirement of its founder and most highly acclaimed creator, Hayao Miyazaki. This makes When Marnie Was There – released in Japan back in 2014 but only finally finding its way to British cinemas this June – as of now the final Studio Ghibli film. This makes its relative failure especially interesting; a dry and comparatively charmless movie, a strange and pale ending to a triumphant cinematic legacy. 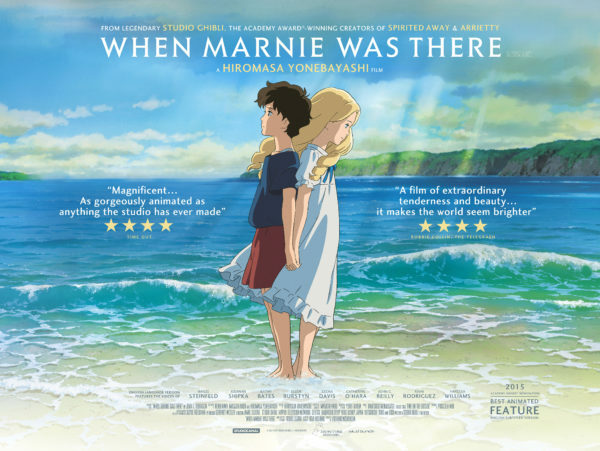 Adapted from a British novel by Joan G. Robinson, When Marnie Was There follows Anna Sasaki, a teenage girl who moves to a rural seaside town to stay with relatives. Anna is shy and introvert; struggling to make friends and distant from her own family, she prefers to spend her time alone, either with her head buried in a sketchbook or off exploring the countryside. One such adventure leads to a mansion; dilapidated and abandoned during the day, yet strangely fully furnished and full of life at night. There she encounters Marnie, a mysterious girl her own age who seems to live in the mansion yet never leaves, and between them a fast friendship begins to develop. As a story about the healing power of friendship, When Marnie Was There is simple but not without merit. Experienced in the original Japanese dub its performances are lively and engaging. Some of its major set pieces – a lavish party scene and a dramatic, clifftop rescue amongst them – are effective, alternately funny or tense in the simple, children’s storybook manner Ghibli can do with its collective eyes closed. In a similar vein, its overall message is good-natured and delivered with straightforward confidence. In the overall craft of the thing, there is little to complain about: this is what Studio Ghibli do, as they have done many times before. And yet that’s part of the problem. It’s widely known that in the face of Miyazaki’s inevitable retirement, Ghibli has struggled to find a director to carry on the good fight: Goro Miyazaki – his own son – has been extremely uneven in his output. Isao Takahata – director of The Tale of The Princess Kaguya – is an extraordinary talent, but one who produces features at the approximate rate of once in a blue moon. Here, Hiromasa Yonebayashi steers When Marnie Was There with the same bland earnestness he brought to The Secret World of Arrietty: faithful to the spirit of the source material, made with all the same visual ingredients as premium Ghibli, yet lacking much of the flare, the style, the creativity. By the time the curtain had risen on When Marnie Was There, I had but one thing scrawled in my notebook: ‘National Treasure?’. No, not a reference to the 2004 Nicholas Cage archeology and action vehicle, but instead a reference to what I think Ghibli has become. There is something stately, respectable, yet wholly irrelevant about When Marnie Was There: a movie made by a company that have become ‘national treasures’. Widely adored, but like treasures they are crucially old, at a distance, revered but not engaged with. Its emotions feel too clean, all surface with no grit. Its animation is of an exceptional high quality, yet static and unyielding; ‘painterly’ in the worst sense of the word. Last year’s The Tale of The Princess Kaguya reveals itself as the exception that proves the rule: brash and visually inventive in what has otherwise been a downward spiral since 2008’s Tales From Earthsea. Their output hasn’t ceased to be good, it’s simply ceased to excite; to explode on screen with visual frenzy and spirited, pacey storytelling. Ironically, there’s a feeling that Studio Ghibli have creatively come full circle, returning to the roots of the 1960’s World Masterpiece Theatre animations that Miyazaki and Takahata cut their teeth on, where the likes of Anne of Green Gables and A Dog of Flanders would be slowly, faithfully, achingly told over dozens and dozens of episodes. Faced with this, there’s something almost comforting in When Marnie Was There being Studio Ghibli’s swansong: The king is still wise, but he has gotten olden. Fresh blood is needed, and will be very interesting to see who in the Japanese animation industry answers the call. This entry was posted on Tuesday, June 7th, 2016 at 12:13 pm	and is filed under Features, Film, Review.